Today: TV series and pop culture themed pencils. You might have previously seen them at BoingBoing. These are actually Chambers pencils that are hand stamped in Glasgow using hot foil stamping. The pencils I have received had the quotes written in gold coloured, upper case characters. I assume all Popcult pencils are like that, with the colour of the body and the quote itself being the main difference between different sets. Chambers is an English company that started in 1913 and then, 99 years ago, became F.Chambers & Co Ltd. As far as I know they now belong to Italy’s Fila and have stopped producing pencils in the UK. The Chambers pencils used by La La Land, the people behind the Popcult pencils, are made in Thailand. Many of the eraser tipped pencils have themes from TV series or movies. The level of accuracy varies. While Star Wars gets proper quotes, including “No, I am your father” instead of “Luke, I am your father”, Star Trek has to suffer the ‘fake’ quote “Beam me up Scotty” – but that doesn’t really matter, I guess. In March I bought the “Star Trek pack of 3 blue stamped pencils” and the “Breaking Bad pack of 3 green stamped pencils” for £3.50 each plus £2 shipping, so £9 (~$15.20; €11) in total for six pencils. Unfortunately I didn’t realise that the colour in the article description is not linked to the colour of the actual product. I ended up getting the same colour for both, Breaking Bad and Star Trek pencils (meth blue / TOS Science blue), instead of the expected colours as seen on their web site. I was told that there is a disclaimer on the etsy shop page that states that colour may vary as they sometimes run out of certain colours, but I didn’t notice the disclaimer when ordering and my personal opinion is that it might be better to remove the colour from the product description and to make the disclaimer more obvious. The pencils do perform surprisingly well. For my taste point retention could be better, but reading other blogs I get the impression that generally point retention is not a big issue for most pencil users. 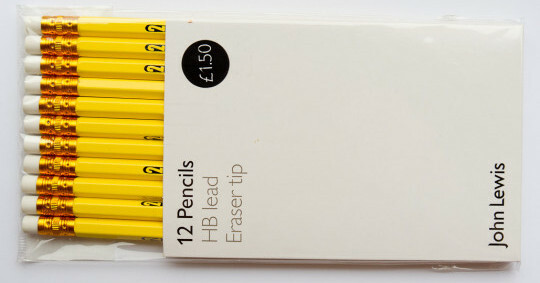 If you are happy to use a B or even a 2B pencil you certainly shouldn’t have any issues with these pencils’ point retention. As stated earlier, the pencils are made in Thailand, so I thought I compare them to some other Thai pencils. By coincidence the Thai pencils I want to compare them to also have a Scottish link: they’re from John Lewis. 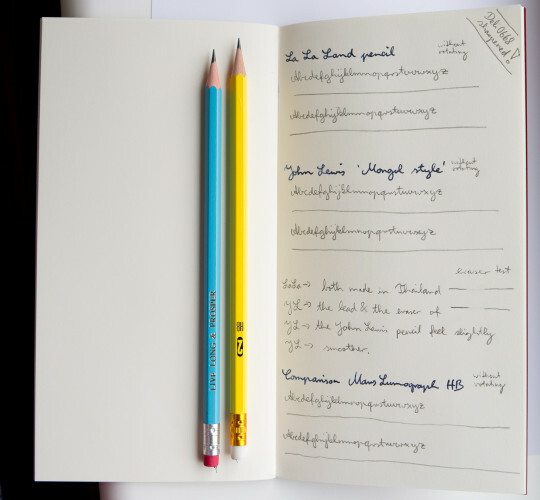 I would describe them as Mongol copies or Mongol type pencils, but as you can see, in comparison with a real Mongol they exhibit a more aggressive shade of yellow. A dozen of these Mongol type pencils used to cost £1.50. I’m not sure whether the price has changed since I bought these, I should check next time I go to a John Lewis store. Please click on image to better see the differences. Paper: Banditapple 3G. Except point retention, mentioned earlier, these pencils are surprisingly good. The John Lewis pencil feels a bit smoother though, and slightly darker, with slightly worse point retention. 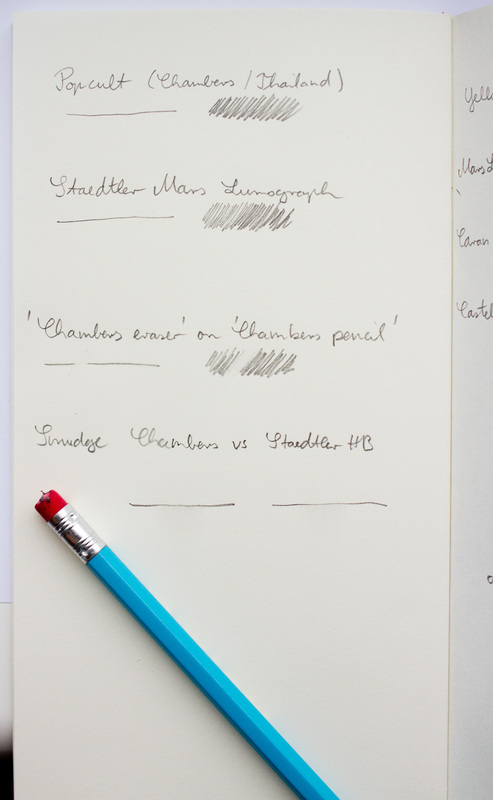 The John Lewis eraser is also smoother and cleaner, but I guess that doesn’t really matter. People buy the Popcult pencils because of the quotes, not because of superior performance – and for novelty pencils they are really good! Sarah from La La Land let me know that they have updated the shop with new photos showing the exact colour the buyer will receive. I think she might also get a new quote for the Star Trek set1. Price (except John Lewis pencils) and exchange rates: May 2014. I’d like to thank Sarah from La La Land for the additional information she has provided regarding the Popcult pencils. You can find more information about Chambers at Palimpsest. I love the combination of the blue and the pink/red of the eraser here. I am beginning to really dislike white erasers on the ends of otherwise beautiful pencils. What is it with the white eraser fetish? I think they end up looking gross. I prefer black or pink/red. Alejandro, some of the black ones I’ve used in the past are really nice! I had some bad experience with cheap red erasers in the past. Is it because of the materials they’re made of? Is it not possible to do a pink in whatever material the white ones are made of? I tend to not use the erasers on the pencil unless it’s an emergency because they just end up looking gunky. I carry a spare Tombow click eraser. I do love the black eraser/ferrule on the General’s Cedar Pointe!!! Is the Tombow Click the blue one? I’m tempted to get a Kokuyo Kadokeshi Mini Eraser. The General’s Cedar Pointe looks nice! In terms of look I really like the T-Prime (see http://bleistift.memm.de/?p=1022 ), probably just because it looks different.